1980 State and Society in Nigeria. Afrografika Books. ISBN 9 7822 4104 0. 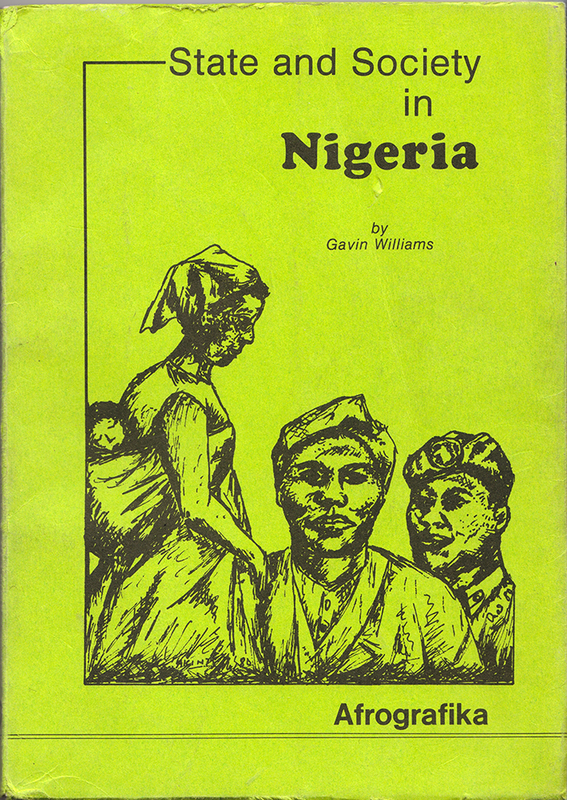 1970 The social stratification of a neo-colonial economy: Western Nigeria. In African Perspectives, ed. C.H. Allen and R.W. Johnson, Cambridge UP, pp. 225-250. ISBN 0 5210 7498 0. 1974 Political consciousness among the Ibadan poor. In Sociology and Development, ed. Emmanuel de Kadt and G. Williams, Tavistock, London, pp. 109-140. ISBN 422 7433 0/ 7574 0. And in G. Williams, State and Society in Nigeria, 1980, pp. 110-134..
1976 Christopher Beer and G. Williams, The Politics of the Ibadan peasantry (1975) In Nigeria: Economy and Society, ed. G. Williams, Rex Collings, London, 1976, pp. 135-158. And in G. Williams, State and Society in Nigeria, 1980, pp. 22-67. 1976/1985 Taking the part of peasants: rural development in Nigeria and Tanzania. In The Political Economy of Contemporary Africa, ed. P. C.C.W. Gutkind and Immanuel Wallerstein, Sage, Beverly Hills, pp. 131-154. ISBN 0 8039 0506 8/ 0592 0. Revised ed. pp. 144-180. ISBN 0 8039 2096 2/ 2097 0. 1977 Gavin Williams and Terisa Turner) , Nigeria. In West African States: Failure and Promise, ed. John Dunn, Cambridge University Press, pp. 132-172. ISBN 0 5212 1801; 2/ 29283 2. And in G. Williams, State and Society in Nigeria, 1980, pp. 68-109. 1980 Ideologies and policies of rural development: a critique. In G. Williams, State and Society in Nigeria, 1980. pp. 135-157. 1980 Agriculture in Nigeria. In G. Williams, State and Society in Nigeria, pp. 158-164. 1981 Inequalities in rural Nigeria. Development Studies Occasional Paper. University of East Angiia. 118 pp. 1983 The Nigerian Civil War (with M. Kiloh and J. Wilmer). Open University Case Study, Milton Keynes, 44 pp. ISBN 0-3351-0248-4. 1984 In defence of peasants. In Readings in Nigerian Rural Society and Rural Economy. Heinemann, Ibadan. pp. 366-377. eds Onigu Otite and Christine Okali. 1987 Paul Clough and Gavin Williams, Decoding Berg: the World Bank in rural northern Nigeria. In State, Oil and Agriculture in Nigeria, ed. Michael Watts, Institute of International Studies, University of California, Berkeley. Research Series 66, pp. 168-201. ISBN 0-8772-5166-5. 1990 J. Akinpelu Obisesan. A Biographical Note. 1991 What disequilibria? people, land and food in Nigeria. In F. Gendreau, C. Meillasoux, B. Schlemmer, M. Verlet, eds, Les Spectres de Malthus: desequilbres alimentaires, desequilibres demographiques. Paris: EDI/ ORSTOM/ CEPED, Paris, pp. 375-396. ISBN 2-8513-9102-X. 1993 The Origins and Outcome of a Civil War, Indicator SA, 11, 2, 1993 pp. 68-72. ISSN 0259-188X. 1972 If there weren’t any chiefs, they’d have had to invent them, and did. Review of Michael Crowder and Obatro Ikime, eds, West African Chiefs, their changing status under colonial rule and independence, University of Ife Press, Ile-ife, 1970, Journal of Asian and African Studies, 7 (3-4), 336-338. ISSN 0021-9096 eISSN 1745-2538.